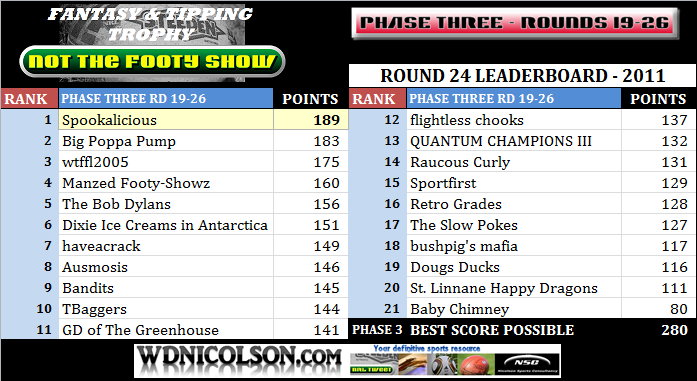 The Leaderboard went silent in Round 19... and with just two rounds left - the Votes are going silent in the Results Blog. 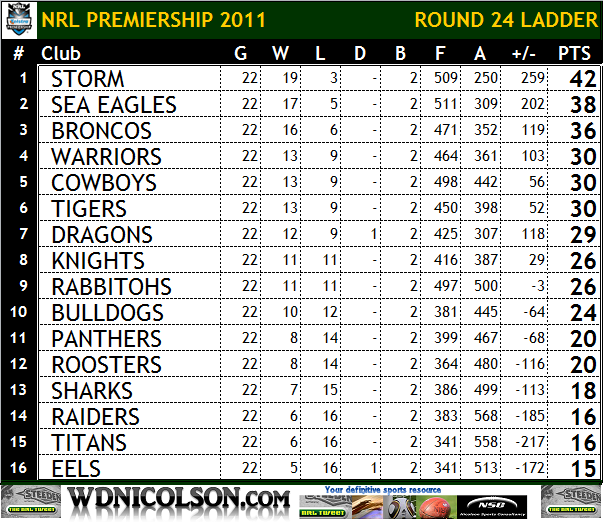 2nd SEA EAGLES TEAM RECORD 17-5 for 38 Points, +202. 1st STORM TEAM RECORD 19-3 for 42 Points, +259. SEA EAGLES 4 STORM 6 - Melbourne won 18-6 in Round 1 but Manly had won both games in 2010 including a Round 22 game at Brookvale. MAN: B Stewart, Robertson, Lyon (c), Matai, D Williams, K Foran, Cherry-Evans, Rose, Ballin, Kite, Watmough, Galuvao, G Stewart. Bench: Lussick, Buhrer, Rodney, T Williams, Robinson. MEL: Slater, Duffie, Nielsen, Champion, Quinn, Kostjasyn, Widdop, Bromwich, Smith (c), Norrie, A Blair, Manu, Proctor. Bench: Hinchcliffe, Waqa, Lowrie, Lowe. Last Word: Melbourne will still win the Minor Premiership, but Manly can make a big statement here by beating Melbourne on Friday. No Cooper Cronk (or will he play?) gives Manly every opportunity to make that statement. SMH and Other Late Mail 26/08 - There is speculation that Cooper Cronk and Maurice Blair will travel with the Storm to Sydney on Thursday and could indeed play. Sisa Waqa and Beau Champion are in the most danger of missing out if they injured pair play. Update: Cronk and Maurice Blair didn't travel on Thursday with the team but could both be late inclusions, there has been no new word on Sika Manu's groin injury but don't be shocked if he doesn't play. Manly will decide between Tim Robinson and Jamie Buhrer for the final bench spot. Triple M reported at 6pm that Cooper Cronk will not play. 16th EELS TEAM RECORD 5-16-1 for 15 Points, -172. 12th ROOSTERS TEAM RECORD 8-14 for 20 Points, -113. EELS 5 ROOSTERS 5 - The Roosters won both 2010 games comfortably - 48-12 in Round 21 and 24-6 in Round 4. The Roosters have also won 3 of the last 4. SYD: Minichiello, Perrett, J Carney, Kenny-Dowall, Graham, Anasta (c), Pearce, Ryles, Friend, Tasi, Takairangi, Guerra, Cordner. Bench: Mitchell, Masoe, Arona, Nu-uausala. Last Word: Parramatta might have just one win since Round 13, but they have played better football than that record suggests. The Roosters might have won 2 in a row but if the Eels shape up - their style could suffocate the Roosters. SMH and Other Late Mail 26/08 - The Eels could be moving Jarryd Hayne back to fullback for this clash, with Luke Burt playing a roving role at five-eighth. There could be other changes for the Eels but check back in around 7pm. The Roosters should be 1-17, with Shaun Kenny-Dowall's hamstring coming up sweet at training. EELS To Win By 7 Points. 10th BULLDOGS TEAM RECORD 10-12 for 24 Points, -64. 8th KNIGHTS TEAM RECORD 11-11 for 26 Points, +29. BULLDOGS 3 KNIGHTS 7 - Newcastle have had the hot hand against the Bulldogs of late - winning both games in 2010 and 4 of the last 5 since 2008. The Dogs however won their last Finals game in 2009. CBY: Barba, Turner, Morris, Idris, Wright, Romelo, Hodkinson, Tolman, Reynolds, Kasiano, Pritchard, Ryan (c), Stagg. Bench: Eastwood, Paea, Warburton, Keating. NEW: Gidley (c), McManus, Lulia, MacDougall, Uate, Stig, Mullen, Tuimavave, De Gois, Kaufusi, Tetevano, Costigan, Houston. Bench: Karawana, Fa'aoso, Edwards, Taufua, Ciraldo. Last Word: Canterbury could still feature in September if they beat the Knights and the Bunnies lose... ok they are a million to one unless Souths and Newcastle draw in Round 26. That said - Ben Barba will inspire the Dogs to a win here over a Newcastle side that is in all sorts right now as the pressure on them intensifies. SMH and Other Late Mail 26/08 - The Knights still don't know if Jarrod Mullen (Shoulder) will play. Tyrone Roberts or Peter Mata'utia would come into the squad if Mullen is out. Kurt Gidley could move to halfback as a result. Adam MacDougall's knee isn't 100% but he should play. Aiden Tolman (soreness) and Andrew Ryan (virus) are expected to play, while Greg Eastwood is out for the rest of the season after having wrist surgery on Wednesday. Trent Hodkinson is expected to play despite a nasty cork in his shin/calf. BULLDOGS To Win By 4 Points. 14th RAIDERS TEAM RECORD 6-16 for 16 Points, -185. 11th PANTHERS TEAM RECORD 8-14 for 20 Points, -68. RAIDERS 6 PANTHERS 4 - Penrith won convincingly 36-10 at Penrith in Round 5 but Canberra got the cookies 24-22 in their 2010 semi final. CAN: Milne, Ferguson, Croker, Thompson, Robinson, McCrone, Williams, White, Tongue (c), Shillington, Galea, Harrison, Fensom. Bench: M Picker, J Picker, Papalii, Mataora, Kennedy. PEN: Coote, Simmons, Tighe, Vaivai, Purtell, Burns, Walsh, McKendry, Seluini, Civoniceva (c), Waterhouse, Plum, Smith. Bench: Kingston, Weston, Grant, Austin, Bell. Last Word: Canberra have tried very little attacking footy this year and that's something the Panthers have bought into since Steve Georgallis took over. Pick Penrith even in Canberra, as at least they'll play some footy. SMH and Other Late Mail 26/08 - The Raiders may make Josh Dugan a late inclusion after he ran at training yesterday but they believe his groin and ankle have just one game left in them before he has to shut it down for surgery. Penrith are expected to give Blake Austin his first grade debut from the bench, and Lachlan Coote's ankle has been given the green light. Luke Lewis could be a late inclusion for this match as he tries to prove his fitness for the Four Nations Tour. PANTHERS To Win By 2 Points. 5th COWBOYS TEAM RECORD 13-9 for 30 Points, +56. 13th SHARKS TEAM RECORD 7-15 for 18 Points, -113. COWBOYS 5 SHARKS 5 - North Queensland beat Cronulla 30-12 at Toyota in Round 7 and have won 3 of the last 4. NQL: Bowen, Graham, Tate. Tonga, Fai-Fai Loa, Thompson, Thurston (c), Scott (c), Payne, Tamou, Cooper, Hall, Johnson. Bench: Segeyaro, T Sims, Taumalolo, A Sims, Bolton. CRO: Gordon, Mills, Collis, Best, Williams, Kelly, Graham, Snowden, Morris, Douglas, Smith, Tagataese, Gallen (c). Bench: Tupou, Mannah, Aiton, Frizell, Cordoba. Last Word: The Cowboys might have blown their Top 4 spot with their loss to the Bunnies, as even with a win here they could be leap-frogged by the Tigers. Cronulla are an ordinary team, pick the Cowboys. SMH and Other Late Mail 26/08 - The Sharks continue to give Paul Gallen every chance to play, with the lock not training all week due to shoulder and calf problems. Matthew Wright is 18th man. North Queensland will make a decision on their bench on Saturday with Jason Taumalolo, Ashton Sims and Scott Bolton fighting for two spots, while Brent Tate (corked thigh) should play. COWBOYS To Win By 16 Points. 7th DRAGONS TEAM RECORD 12-9-1 for 29 Points, +118. 4th WARRIORS TEAM RECORD 13-9 for 30 Points, +103. DRAGONS 9 WARRIORS 1 - St.George-Illawarra might be struggling right now but they own the Warriors - winning the last 5 games including a 25-12 result in Auckland in Round 3. STI: Boyd, Morris, Gasnier, Cooper, Nightingale, Soward, Hornby (c), Hunt, Young, Weyman, Scott, Creagh, Prior. Bench: Cuthbertson, Merrin, Stanley, Fien, Rein. WAR: Locke, Tupou, Moon, Berrigan, Inu, Maloney, Johnson, Packer, Heremaia, Lillyman, Mateo, Mannering (c), Luck. Bench: Brown, Hohaia, Matulino, Sam Rapira, Taylor. Last Word: If St.George-Illawarra can't win this then they might be stuck in 7th spot by the end of the weekend - as they could be 3 points behind 6th. The Warriors differential bonus means a win here is huge for their Home Final campaign. SMH and Other Late Mail 26/08 - The Dragons will make the final decision on their bench on Sunday - despite being named 18th man, expect Nathan Fien to play as cover for Jamie Soward's back. Beau Scott is in minor doubt with a hamstring strain, while Adam Cuthbertson should return on the bench. The Warriors will likely make Lewis Brown 18th man after he was listed in the NSW Cup at centre, with Micheal Luck's shoulder responding well to treatment. DRAGONS To Win By 2 Points. 3rd BRONCOS TEAM RECORD 16-6 for 36 Points, +119. 9th RABBITOHS TEAM RECORD 11-11 for 26 Points, -3. BRONCOS 6 RABBITOHS 3 DRAW 1 - South Sydney won 16-12 in a wet and wild encounter in Perth in Round 16 but were smashed 50-22 against an understrength Broncos team in Round 14 at Suncorp last season. SOU: Merritt, Farrell, Corrigan, Inglis, McQueen, Sutton, Sandow, Ross, Luke, McPherson, Pettybourne, Taylor, Crocker (c). Bench: L Burgess, Tyrrell, Clark, Peats. Last Word: Brisbane will miss Justin Hodges, but the Bunnies need Merritt and Inglis to play to be any hope. Brisbane have less to play for, so if you need an upset - go the Bunnies. SMH and Other Late Mail 26/08 - The chances of Nathan Merritt playing will be determined on Friday - if he passes a fitness test he'll play, otherwise he'll be saved for Round 26 against Newcastle. Greg Inglis should play as will John Sutton (hand), while Roy Asotasi might have to wait til Round 26 as well. Update: Merritt, Sutton and Inglis will be assessed Friday - as will Dave Taylor (Hip), while Asotasi could be a very late inclusion. James Roberts and Fetuli Talanoa are on standby. The Broncos may bring Dale Copley in and shift Ben Te'o back to the bench with David Hala missing out. 6th TIGERS TEAM RECORD 13-9 for 30 Points, +52. 15th TITANS TEAM RECORD 6-16 for 16 Points, -217. TIGERS 3 TITANS 5 - The Titans have won the past two games at Skilled Park - 20-14 in Round 6 this year, and 21-18 in Round 26 last season. WTG: Moltzen, Ryan, Ayshford, Utai, Tuqiri, Marshall, Lui, Gibbs, Farah (c), Galloway, Fulton, Ellis, Heighington. Bench: Brown, Payten, Groat, Woods. Last Word: The Tigers should win this convincingly... do not pick the Titans. I repeat - do not pick the Titans. SMH and Other Late Mail 26/08 - The Tigers expect Lote Tuqiri to line up on the wing after overcoming a quad strain. Wade McKinnon will play NSW Cup, as will Andrew Fifita. Bryce Gibbs has a leg gash but it should be fine by Monday. Luke Bailey remains in some doubt with neck soreness and Clinton Toopi likewise with concussion but given the depleted playing stocks of the Titans - expect them to play. TIGERS To Win By 20 Points. 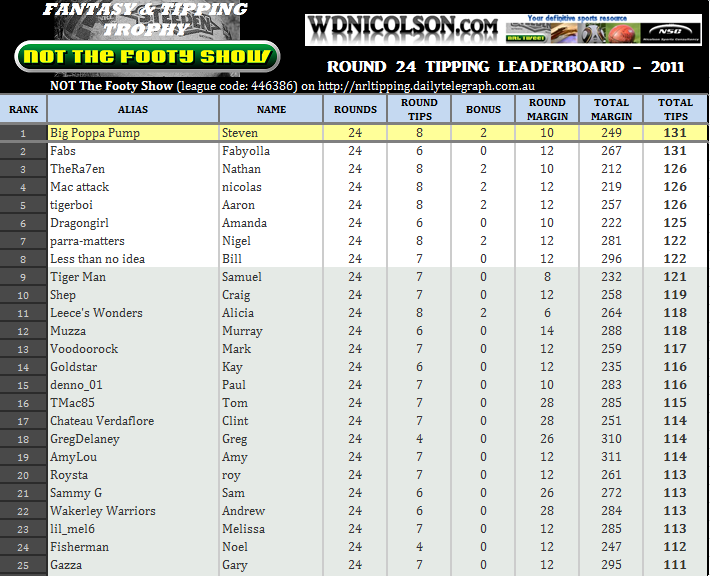 ]-[ There are just 3 weeks left in NOT The Footy Show's Tipping Competition and the outright winner walks away with an Official Steeden Match ball.